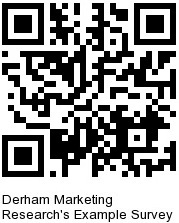 Online surveys - Derham Marketing Research Pty. Ltd. If you are new to us, you may wonder about our work. Mostly, we can’t show you that, because it is undertaken for clients and we properly keep all their data and findings confidential. But we use online surveys extensively and have done so since 2001. Hence, we do know a bit about how we can get you the most effective knowledge to strengthen your decisions, when we use online surveys for you. An example online survey – one of our 20 Questions One Topic Monitors™ surveys – can give you a flavour of how our surveys look and perform. You are most welcome to complete an example survey about social media use, as a “try before you buy” exercise. The link or the QR code (for scanning with your phone) is below. When you have finished the survey (on your phone, tablet, laptop or PC), and want to know how this or similar marketing research can help you, contact Philip Derham. To find out more, contact Philip Derham – by email at Philip.Derham@derhamresearch.com.au or phone (+61) 0414 543 765.